I Made A Card In 30 Minutes! Today's Limited Supplies Challenge on SCS was to make a 30 minute card. Yes, this is definitely a challenge for me! I usually play with a card for hours! 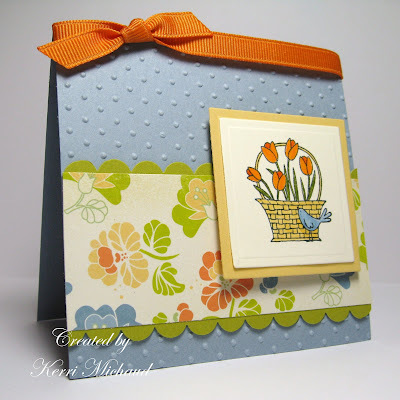 I decided to make a 4x4 card, and used this adorable set~A Flower For All Seasons by SU. I stamped the image, colored it in, layered it with Nestabilities, added the strip of dp with the scallops, ran the base of the card through the CB Swiss Dots Folder, and added the ribbon! Very quick and easy, and I really should do this more often! Thank you so much for stopping by today, and I hope you have a wonderful weekend! Love all your layers too! I kinda knew your cards took you a while - all your detail and whatnot. But this is just as good as the rest of 'em! Love this card! So pretty! & thanks for the sweet comment you left on my Fun-Frilled baby girl card!!! Your 30-minute card is fabulous!